Britax is an international developer of childcare products, such as high chairs, strollers, car seats and other innovative products. The company was established in 1938. Its manufacturing practices and quality assurance procedures have made Britax a leading brand of child car seats in Europe and in the US market. The company also offers a wide range of car seats to serve kids with special needs. The Britax B-Ready Stroller is exclusively designed for kids of at least six months old. Dimensions: The Britax B-Ready Stroller weighs around 37 pounds and measures 40.8 x 26.5 x 45 inches. Adaptable Design: The Britax B-Ready Stroller is a multipurpose and modular stroller. You can easily change its settings to make it an in-line double stroller. Its adaptable design offers 14 configurations to accommodate your special needs. Click and Go Receivers: The baby stroller is the perfect option for growing families. It features the Click-and-Go adapter system. With this system, you can convert the Britax B-Ready Stroller into 14 configurations. It allows you to adjust the top seat rear or forward facing and fasten a bassinet or join a baby car seat to arrange a unique travel system. Rubber Tires: The Britax B-Ready Stroller features foam filled tires that absorb bumps efficiently. These tires eliminate air hassles and create a smooth ride for your child. Weight Capacity: The Britax B-Ready Stroller’s top seat offers a weight capacity of almost 55 pounds. Canopy: The baby stroller includes a large sun canopy to protect your child from weather elements. Suspension System: The Britax B-Ready Stroller features a full suspension system to offer the best traveling comfort to your little ones. Second Seat: The Britax B-Ready Stroller includes a second seat that offers 4 reclining positions. The weight capacity of this seat is 35 pounds. Brake Pedal: It is possible to lock and unlock this brake pedal using your foot. It also includes a red/green indicator to show you the status of brake pedal. 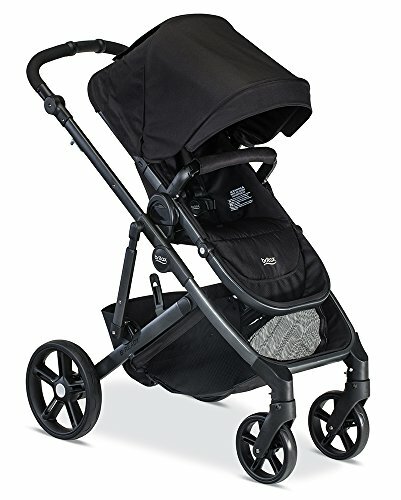 Folding Mechanism: The Britax B-Ready Stroller’s simple design allows you to fold this baby stroller easily and quickly. It can fold with the top seat as well as the second seat. Storage Features: The Britax B-Ready Stroller features a huge storage basket under the seat. You can access this basket from all sides. A cup holder for adults is also provided on the frame’s side. Designed to accommodate more than one kid. Green/red indicator shows brake status. Foam filled tires made of rubber. The Britax B-Ready Stroller is a heavy stroller. Some people find it difficult to push this stroller up to the hills. The Britax B-Ready Stroller is just the thing every growing family would definitely love. If you’re looking for a stroller for more than one kid, then this product will prove to be a great choice.